Irish sweatshirt features a distressed print Irish flag with the word Ireland superimposed. This Irish sweatshirt is available in limited sizes. The Irish flag sweatshirt features a pigment dyed design that includes the word Ireland. The dorm green color, pullover Irish sweatshirt is 100% cotton with a Lycia waistband and also has rib knit cuffs and collar. 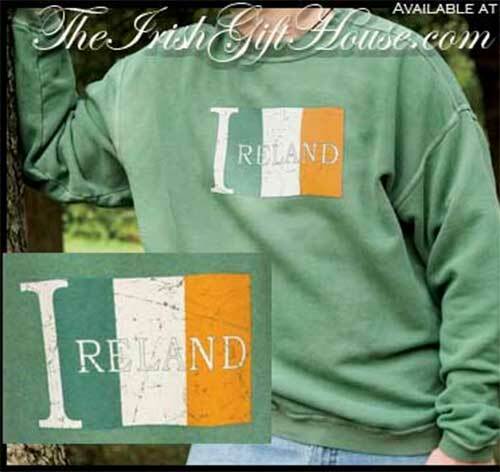 This crew neck sweatshirt, from The Irish Gift House, is available in size small only. Irish sweatshirt is a forest green hoodie that features Celtic dragons that are enhanced with a knot-work motif. Forest green hoodie has the word Irish boldly embroidered across the chest of the sweatshirt. Hoodie features the word Irish embroidered across the chest of the forest green unisex sweatshirt.